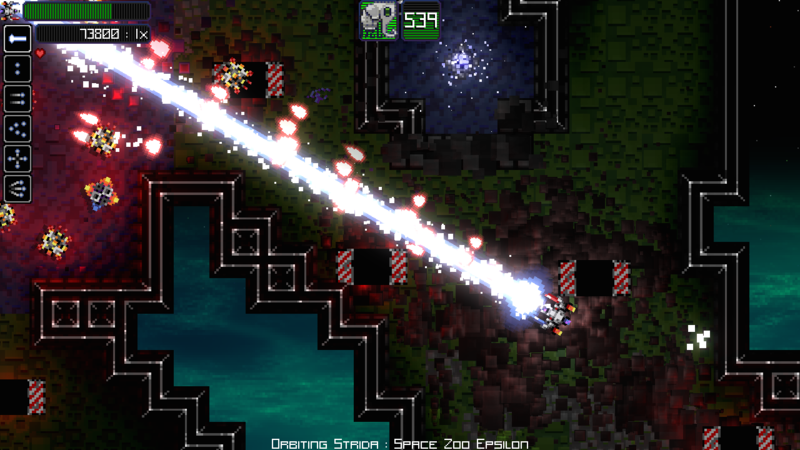 Rescue exotic space animals from a corrupt AI in Dr. Spacezoo, a chaotic procedurally generated twin-stick precision shoot-em-up for 1-4 players. Or reduce them to grease, your call monster. Your mission is to save exotic space animals and get out of the Space Zoo before the Space Zoo AI cracks your ship’s control software and does bad things (mostly explosions). Your ship’s communication signature is coded to look like a sentry bot, but the ruse will be discovered if you make any hostile actions or touch any animals..
* Scoring Improvements: Points are now shared to everyone that damages an enemy or animal. Previously all points went to the player that dealt the death blow. * Shadow system bug fix. Also, should no longer see the shadow map texture on level zoom in/out. * Dialog UI: complete rewrite of Dialog UI used to interface with the good Dr. Spacezoo and Winston. Meow! – Action Mode: Each time a boss is defeated it will gain health, attack faster, and gain an Ultra making Weapon Upgrade farming more challenging. – Health Booster (Ultra): A passive effect that boosts base health per rank. – Health Regeneration (Ultra): A proc effect that restores a small amount of health per rank. – Melee Deflector (Ultra): A rotating shield that increases in speed each rank and gently bumps away anything it touches. Stops a lot of bullets. – Melee Damager (Ultra): A rotating weapon that increases in speed each rank and does damage to anything it touches. Does NOT stop any bullets. – Vortex (Ultra): A proc effect that harmlessly pulls in enemies, animals, and bullets. – Force Vortex (Ultra): A proc effect that forcefully pulls in and damages enemies, animals, bullets, and destructibles. * Photon Density/Bullet and Damage weapon upgrade icons now indicate increased rarity level. * Secondary weapons are now drops in Permadeath mode. * Music volume bug fix and other minor bugs squished. * New Boss Rush Mode: fight all through all of the bosses and random double boss battle royales! * Procedural generation: improvements to procedural level generation, added resistence spawners to hubs (activated after saving target animal), tweaks to difficulty flow, firing delay to turrets in zoo entrance room, now procedurally generating mission and level names (missions 2-5: mining, scrapyard, mainframe ai, space lab), added loading screen during procedural planet generation, added ultra size for stars (title screen star), procedural star improvements. * Scoring: larger score multiplier, score multiplier reset by killing animal, increase score multiplier by saving animals/killing enemies, increased boss base score, score multiplier applies to time score. * UI: improvements to button/UI colors, added loading screen during procedural generation, increased title drop shadow, procedurally generated star on title screen, font character/kerning fixes. * bug fixes for Windows 10 and Linux. * improved mission 1 boss fight and art. * co-op: individual scores, upgrades, and power-up selections. * co-op: improved player ui and joystick handling. + Migrated to Unity5, webGL export broken..
* added a new warning klaxon for when the timer is about to expire. * Fully twin-stick controller ready! * Proc-gen daily spacezoo challenge / tweet! * Power-ups now are now an immediate and very noticeable boost. * Tutorial (level 1) improvements! Save the animals and get out of the zoo! * new enemies: turret, rammer, sentry spawner, feed bot. * power-ups: acceleration, haste, damage, hack defense, physical defense, pickup radius. * added scoring for saving, destroying and euthanizing animals, and a time bonus. * TONS of code refactoring, bug fixes, and new bug introductions.